Make sure to use the custom import tool on your very first step. This will import your forms in a time range between 45mins-2hrs only.. depending on the current load of the system with those other users also already importing and in queued on the system. Please contact us anytime for any assistance you need. Unfortunately option to import both forms and submissions is currently unavailable. 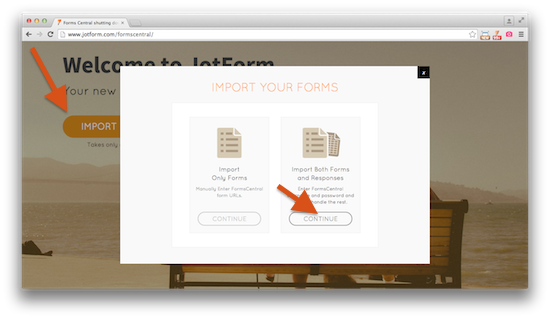 You can import your forms by using option 'Import Only Forms'. After that you can import your data with our Import Data app. I've checked your account and it seems all of your forms and submissions are imported. We did some changes on our import process. From now on you can import your forms and submission by using our exporter app. You can download it by using option Form + Responses option on Adobe FormsCentral Alternative page.